Product names are important. They set your expectations and, in an ideal world, tell you everything you need to know. For example, if I order an American IPA I know to expect something pale and sweet, on the strong side and with some powerful, fruity hops. If, instead, I get a pint of Mild – even the best, most perfectly constructed Mild in the history of all brewing – I’m inevitably going to feel a little disappointed. This brings us to Discount Coffee, which is a fairly comprehensive, one-stop shop for coffees, teas, and everything you might need for your coffee shop – from cups, sugar, biscuits and cleaner right up to domestic and commercial coffee machines. All of which is great but, in a “Mild instead of IPA” kind of way, the actual coffee isn’t particularly discounted. It’s not expensive, but neither is it cheaper than just walking into your local supermarket. They sell their own blends as well, which of course aren’t available in the aforementioned supermarket. But as always, at the end of the day what’s most important is how the coffee tastes! Larozza Crema is a “premium” Italian blend of South American beans (although the blurb also, rather confusingly, talks of Larozza using “only the highest quality coffee beans, from coffee plantations around the world”, so who knows). The “premium Italian coffee” tag brings me back to my earlier point about names. 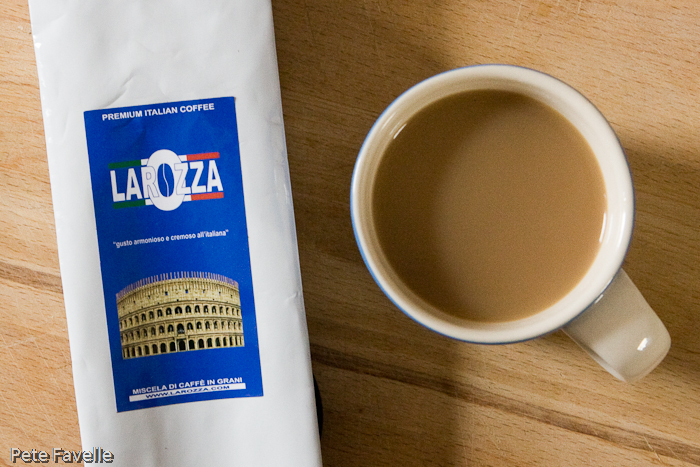 When I see something described as an Italian coffee, I’m immediately expecting something dark, heavily roasted, strongly flavoured – perhaps not subtle, but the ideal kind of wake-me-up-now morning coffee. The grounds themselves are a little on the light side, but the aroma certainly ticks those boxes; soft brown sugar, toasted walnuts and just a touch of burnt sugar – delicious! Once brewed, the sweetness goes and although there is still a nutty character, backed up with a deep roasted bitterness, it’s muted and restrained. In the mouth, it’s even more understated – there’s a touch of sugary sweetness and a subtle background of tannic bitterness but there’s just no depth to it. Not wishing to be defeated, I’ve done everything I could think of to squeeze some punch out of this coffee. I’ve brewed it longer. Hotter. I even dug out my moka pot to see if that would help, but without success. If I’d been expecting a gentle coffee then this would have scored well – it’s light, gently tasty with a nice aroma. But because I was expecting a powerful Italian brew, I can’t bring myself to give it more than 2 stars. Many thanks to Discount Coffee for this sample.